Business of the Week: Bennett Main Gubbrud & Willert, P.C. Home > Blog > Featured Member > Business of the Week: Bennett Main Gubbrud & Willert, P.C. Bennett Main Gubbrud & Willert, P.C. law firm was started by Dan McCutchen in the Hampton Hotel building, which was located on the lot occupied by Wells Fargo Bank. The firm has provided legal services to the Tri-state area for over a century. 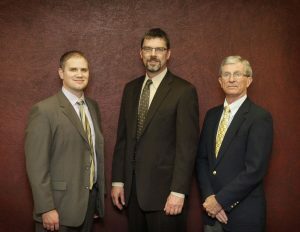 The firm brings together over 60 years of practicing law for clients in South Dakota, Wyoming, and Colorado. Partners in the firm handle complex legal issues relating to real estate, business, natural resources, mining, oil & gas, water, family, criminal, military, school, and municipal law. Lawyers from the firm have served as Lt. Governor, a South Dakota Supreme Court Justice and Presidents of Rocky Mountain Mineral Law Foundation, an organization dedicated to the study of legal systems and issues affecting domestic and international mineral and water resources.